About: Union Hospital of Cecil County is a full-service community hospital located in Elkton, MD. The 83-bed, not-for-profit organization has been nationally recognized for clinical excellence, achieving HIMSS Stage 7. Challenge: Situated in Maryland near the Delaware border, Union Hospital serves a diverse patient community across a variety of care settings and coming from multiple states. Access to information is challenging, but important to avoid gaps in care. 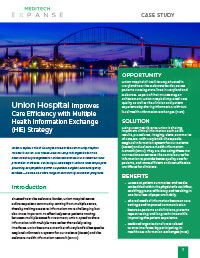 Execution: As part of their HIMSS Stage 7 achievement, Union Hospital improved care quality as well as the clinician and patient experience by sharing information with two local Health Information Exchanges (HIEs). Union became a member of Maryland’s Chesapeake Regional Information System for our Patients (CRISP) and the Delaware Health Information Network (DHIN). Easily access clinical summaries, clinical health portals, and alerts embedded within their workflow. Improve the patient experience with more coordinated care. Decrease the time spent on paperwork, by one hour daily. Cut costs for patients and the hospital by eliminating redundant testing and reducing EHR interfaces.